Yes you can certainly bring children of any age bareboating! Kids love a bareboat holiday. There’s so much to see and do, they’ll be so exhausted they’ll sleep beautifully every night. 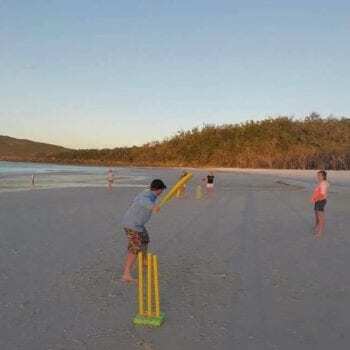 Your little “esca-peas” will have as much enjoyment bareboating around the Whitsundays as you will. It is sure to be one of those holidays they will remember for the rest of their lives. Bareboating is a great family holiday: fishing, snorkelling, swimming, coral viewing, tame fish, whales, beaches… exploring the pristine environment and interacting face to face instead of being on phones or ipads all day. Sailing and boating are amazing family bonding activities. How about learning to sail as a family? Sailing lessons will teach your children lifelong confidence and leadership skills, and give them an activity they’ll be able to enjoy for the rest of their lives. There’s no age limit for bringing children on a bareboating holiday. You may like to ask the grandparents to join you for some quality time with their grandkids. Many hands make light work and everyone will love the family bonding time a bareboating holiday provides. Bareboating holidays with kids can be so fantastic, you’ll wonder why you didn’t take the children bareboating sooner! Whitsunday Escape boats are very safe for children. There are safety lines all around. Families tend to prefer a catamaran because there is more deck space for the kids to move around on board, and they are considered generally more stable. Babies are easily catered for and the gentle rocking of the boat normally means a well slept baby. Some cabins have a smaller bunk within them where the little one can sleep safely or we can provide you with a portacot which also acts as a secure playpen. Please don’t hesitate to contact us if you would like to discuss requirements for your little ones. With lots of parents on staff, we know what works, from experience. Adult-size multi-fit life jackets form part of the standard safety equipment on board all boats. These life jackets are bulky and generallynot the best fit for children.Whitsunday Escape offers a number of smaller baby and children’s life jackets to borrow free of charge. The office staff will assist you to fit children’s life jackets before you depart. While it is not a legal requirement for children to wear a life jacket on a bareboat, we do recommend you set the rule early in the holiday that children wear life jackets whenever the boat is moving, and when in the dinghy. A bareboat holiday is the perfect way to have a digital detox. 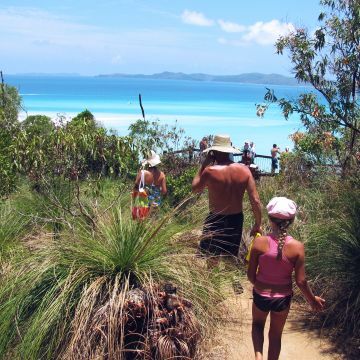 You will get phone coverage on the west side islands and around Hamilton Island but there is no phone reception on the eastern side of the islands. To help your children through the detox withdrawal symptoms we suggest a deck of cards or an easily packed board game, great for after dinner entertainment. All boats have TVs on board with built-in DVD players, as well as USB and HDMI cables, so feel free to pack a hard drive of movies or a couple of DVDs for movie nights on the boat. Check out our blog for some ideas of family games you can play with and without smartphones or tablets, and what else to do on a bareboat without watching TV. A bareboating holiday is a learning opportunity like no other. The hands on experiences children will have will teach them so many new and wonderful things. You can teach the children how to sail the boat and drive the dinghy. Kids can learn how to snorkel and identify dozens of tropical fish and corals. Buy a souvenir map and tropical fish guide at our office to help identify all the amazing colourful fish species you will see. They can help navigate and choose your next destination. Mark your journey on the souvenir map as a memento of your holiday. You can hire a SUP or a kayak and let the children paddle it themselves. Kids can get given certain jobs on board that are their responsibility, giving them a sense of ownership and importance to help with the family bareboating experience. Can a teenager under 18 be a bareboat skipper? Yes, if they have enough experience and can handle it. We have no age limit on who can skipper a bareboat, if they have the required experience. We do require that a person over the age of 18 years is on board, and is responsible for the boat as the primary ‘charterer’. Otherwise it’s a great opportunity to be near your kids and teach them how to sail or drive a boat. If you have small children on board for your holiday, you might want to take them for a wander into Airlie Beach during the briefing. Your skipper and first mate might get the briefing done faster if the toddlers are not on board. It takes about 15 minutes to walk into Airlie Beach (1km away) via the scenic waterfront boardwalk. If you stick to the coastline instead of following the road, you will come across the Airlie Beach Lagoon precinct. The Airlie Beach Lagoon is a big public swimming pool, with a shallow kids area at the closer end. There is sheltered playground equipment, several picnic huts and BBQs, and a Liberty Swing too! You could collect some last minute supplies whilst in town. Two main street chemists stock a variety of fun play items like giant inflatables and kids toys, as well as essential items such as sun hats, sunglasses, beach bags and beach towels. Woolworths is just behind McDonalds if you need any last minute groceries or snack items. Or just treat yourselves to an ice cream for morning tea before heading back to the boat for departure. What do teenagers like about a bareboating holiday?